The gorgeous hue is actually called Blue Rocket. 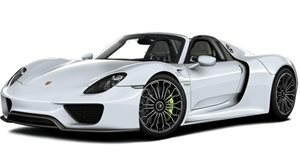 With carmaker’s bespoke departments offering an infinite array of colors and two-tone blended finishes, those in the privileged position to purchase supercars like the Porsche 918 Spyder must have sleepless nights wondering what color to buy it in. CJ Wilson’s one-of-a-kind Cerberus Pearl McLaren P1 was one of the most stunning finishes we’ve ever seen on a car, but this baby blue Porsche 918 Spyder is certainly one of the best-looking body colors on Stuttgart’s finest. Dubbed the Blue Rocket, the car is being kept at the Porsche Zentrum Zug dealership in Switzerland, and comes with a set of green brake calipers. Is this the nicest color you've seen on a Porsche 918 Spyder, or have you seen something even better?